Yes, his speed and overall brilliance has been established, but his mind plays a huge part in his success. He has a wonderful relationship with people and knows exactly what he has to do, whether racing or training. Part of that is due to the amount of contact he had with people as a foal. His dam had a difficult time foaling him, suffering lacerations, and she and her foal had to remain in confinement for an extended period of time until she recovered, and he got to interact a great deal with people, while developing quite a personality and becoming very independent. Because he wasn’t able to socialize with the other foals in the beginning, he became more focused on people than he was on horses. To this day, he still has maintained those close ties to people. In his early days on the track at the farm he loved to go out and train every day and always enjoyed what he was doing and learned his lessons like a pro. And he was never sick a day while he was there; not even as much as a slight fever. The quote of the week goes to co-owner Steve Coburn, who had turned down a reported $6 million for the horse before the Santa Anita Derby. When a significantly higher offer came in after the Santa Anita Derby, Coburn’s reply was, “My answer last week was “no” and my answer now is “hell, no.” Some dreams are priceless. It’s not every day you can collect $200,000 for a workout, but that’s pretty much what Baffert and Hoppertunity’s owners did when the colt ran second in the Santa Anita Derby without raising much of a sweat. He was able to get dirt kicked in his face racing on the inside and then drew clear of the others by 3 1/2 lengths without any urging whatsoever from Mike Smith. Baffert reads his competition as well as anyone and he knew it would be futile and counter-productive to bust a gut trying to chase down California Chrome, so he got exactly what he wanted – a good solid Derby prep without taking anything out of the horse. There is no reason why he shouldn’t be ready for a peak performance off that race. And for all those concerned about the Apollo curse, remember, he was entered last Nov. 22, but was scratched the morning of the race because of a fever. So although he didn’t debut until Jan. 4, he was ready to run a month and a half before that. The Apollo curse can be interpreted in two ways. One is the maturity and development factor. It’s not only about when they debut but when they’re ready to debut, and he was developed enough, fit enough, and sharp enough to run well before Jan. 1, as evident by the five races he’s crammed in this year in three different states, while moving forward each time. It’s hard not to root for a Jerkens family Derby victory, just to watch Allen bawling after the race, unable to speak. Jimmy has had some tough luck on the Derby trail, losing such talented and promising 3-year-olds as Iron Deputy, Quality Road, and Corinthian. This could be his year, considering it was Centennial Farm, owner of the volatile and unpredictable Corinthian who remained loyal to him during his recent dry spell after losing several of his main clients and a good portion of his stable. There is also the Boston karma regarding the colt’s name and Centennial donating a portion of his winnings to the Boston One Fund to assist those affected by the Boston Marathon bombings. This colt’s two best races have been at 1 1/8 miles and he definitely is one of those who looks like he should relish 1 1/4 miles. And here is my New Jersey trifecta box for the Derby – Hoppertunity, Wicked Strong, and Ride On Curlin, whose sires (Any Given Saturday, Hard Spun, and Curlin) finished first, second, and third in the 2007 Haskell Invitational. All are powerful closers coming off super efforts in their final prep. It is also interesting to note that the owners of Hoppertunity and Wicked Strong both won Breeders’ Cup races at Monmouth Park in 2007. And Curlin won that year’s Breeders’ Cup Classic, with Hard spun second. Are you reading this, New Jersey? If you could gauge a horse’s ranking on a scale, on one end of this colt’s scale you have three career starts and 99 years and 132 years of history to overcome. On the other end you have the colt’s raw talent, which appears to be limitless at this point. The question is which end of the scale will be weighted down more on May 3? He had his first work since the Florida Derby, breezing an easy half on his own in :50 3/5 at Palm Meadows. Like all the Pletcher Derby candidates training at Palm Meadows, he is scheduled to work one more time next week and then ship to Churchill on April 22, where he’ll have one final work over the track. Watching the Florida Derby, he couldn’t have had a more perfect ground-saving trip and then finding an inviting opening on the rail, but give him credit for going through and showing his competitive spirit by out-battling a gutsy and far more seasoned Wildcat Red in only his third career start. Now comes the question of how he’ll handle a 20-horse field with plenty of expected speed and pace pressure having only three starts under him. It’s not going to take much to tip that scale one way or the other. Talent vs. history? Yes, like everyone else, my first thought was, “Where the heck did that come from?” Talk about crashing the party at the 11th hour. I had watched this colt’s other races beforehand and still couldn’t see it. And a son of the sprinter Street Boss no less. But then I saw something that I have to admit provided the vision of sanity I had been looking for, at least to some degree. The colt was bred by Rob Whiteley’s Liberation Farm in partnership. Rob, sadly, no longer is in the Thoroughbred business, but his impact on the breed remains. I admit to not being objective, as Rob and I have known each other for 42 years, back when he was a professor at Rutgers University and I was a lowly librarian at DRF. Not only has Rob bred 20 grade I stakes winners for Liberation and Foxfield, I know his philosophy well, and he breeds for toughness – old school, strong boned and muscled milers with speed who can carry it a distance of ground. This colt fits his m.o. to a tee. He has gotten more out of mile pedigrees than anyone I know, and he actually is responsible for the breeding of Danza’s sire and dam. I still don’t know how this colt did what he did coming off only one so-so seven-furlong allowance race (beaten 7 1/2 lengths) in the last eight months. To not only beat all these seasoned stakes horses, but to crush them with a stunning :12 1/5 final eighth and running the 1 1/8 miles only .13 one-hundreths of a second slower than Will Take Charge the race before was nothing short of amazing. Visually, I love his action, the way he drops his shoulder, and the reach and efficiency of his stride. And as remarkable as it may seem, he found another gear in the final sixteenth and was running through the wire as if he was just getting started. As far as him being a major Derby threat, my brain is still trying to compute what we saw on Saturday. I have no idea what we’re dealing with, but that was as impressive as it gets and he sure looked like the real thing to me. This colt continues to intrigue me. Mike Maker has been tinkering with his blinkers, which were put on after his career debut to suit Gulfstream Park’s style of racing, and as I mentioned last week, there is a lot more to him than what he’s shown so far. Also, it was learned that Joel Rosario lost a stirrup going into the first turn in the Florida Derby, which certainly didn’t help. It could very well have happened when he bumped hard with Constitution. These are important factors to consider going into the Derby, where I expect to see a totally different style of running, reverting back to his career debut at Keeneland, when he turned in an explosive move from the back of the pack to win going away. Between the blinkers tinkering (or removal?) and the likelihood of him getting sucked farther back off the pace with all the expected speed, we could see a different horse on Derby Day. To touch on his pedigree once again, his sire, who won the Haskell, is by Kentucky Derby winner Fusaichi Pegasus; his broodmare sire is major stamina influence Dynaformer, sire of Kentucky Derby winner Barbaro; his third dam is a half-sister to French Derby winner Caracolero; and his fourth dam is a half-sister to Kentucky Derby and Preakness winner Majestic Prince. He is stabled at Trackside training center near Churchill Downs, so he likely will be out of sight, out of mind. But it wouldn’t be wise to put him completely out of your mind. Now that the dust of the Florida Derby has settled and he is in the top 20, I am moving him up, based on several factors. I’ve watched the Florida Derby numerous times, and each time it hits me a little more how that race was stacked against him, especially coming off a nine-week layoff, no long works, and obviously being a bit short for such a top-class competitive race. He wound up farther back than he’s used to after getting a bit intimidated when General a Rod bumped Constitution right in his path going into the first turn. He then had to be put under pressure early off such a slow pace and make a big four-wide move on the turn to reach contention and then lost ground circling horses turning for home, while the winner cut the corner, gaining a big advantage. I put a watch on him several times from the half-mile pole to the quarter pole and each time I got him in :23 1/5. That was too taxing a next-to-last quarter move going so wide, and he had every right to get tired in the final quarter. But even so, I thought he was striding out well enough and just simply got outrun. In 2005, McLaughlin had Closing Argument go into his final Derby prep, the Blue Grass, off a similar layoff after winning the Holy Bull and off a similar work pattern of four- and five-furlong works. He, too, came up short, finishing third, beaten nine lengths, and then finished second, beaten a half-length, in the Derby at odds of 71-1. And Closing Argument was by a sprinter/miler, out of a mare by a sprinter, so McLaughlin is treading over the same ground, but with a more talented horse with a stronger 1 1/4-mile pedigree. And let’s not forget, he was giving away a good chunk of weight in the Holy Bull and his beaten foes in that race came back to win the Wood Memorial, Risen Star, Bay Shore, and Calder Derby. He is another who could come back to haunt you if you dismiss him off the Florida Derby. I’ve been waiting to see his first work since the Louisiana Derby and he did everything the right way, working a half in :48 4/5 at Palm Meadows in company with We Miss Artie. Like the beaten horses from the Florida Derby, if you liked him before, you cannot give up on him off that second-place finish at Fair Grounds. I wish he had pulled his dipsy doodle sidestep in his start before the Louisiana Derby, so he’d have a chance to get a nice clean final prep in and show that was some fluke occurrence, which it likely was. You never want to see a horse that discombobulated and making a left turn into the rail just when he had his sights set on the pacesetting eventual winner. I keep mentioning the push-button acceleration he showed just before he messed up his action. It wasn’t the first time he’d shown that kind of turn of foot, so it wasn’t a fluke. I also want to think of all those fast closing and middle fractions he’s thrown in before. Those were the kinds of fractions you want to see in a Derby horse. Yes, the horse he barely defeated in the Risen Star didn’t run very well in the Louisiana Derby, but Vicar’s in Trouble, Hoppertunity, and Commanding Curve all came out of the Risen Star and ran huge in their next start, so we can call that a wash. I was really debating where to put this horse, because I still don’t know how I feel about his chances in the Derby. Other than Uncle Sigh I’m not sure just what he’s been beating, and he just barely nosed out a tiring Social Inclusion for second in the Wood Memorial after having clear aim at him in the final furlong. He also has a tendency not to switch leads and seems to alternate races changing and not changing. But that said, he is such a hard trying horse and is such a fighter, you can’t help but give him a shot wherever he runs. Can he take back and rally from midpack in a 20-horse field if that’s where he finds himself? That’s one of the questions we won’t have an answer to until the Derby. But you have to admire what he’s accomplished so far, and he’s one of the horses I really want to see train at Churchill before assessing his chances. But it looks like he won’t be shipping in until Derby week, so we may have to go by gallops and overall appearance. Well, he delivered by presenting his connections with an invitation to Churchill Downs, and that’s all you could ask of him, especially under the circumstances and such a freaky performance by a 71-1 shot. He at least did the one thing I was hoping to see and that was come from off the pace and make one late run. Even though he lost valuable ground fanning wide at the top of the stretch, this was a huge step forward, and he now seems as if he’s reverting back to the horse we saw fly home from eighth in the Champagne Stakes. He has the bottom and the experience, and I hope they stick with Jon Court, who has had some tough luck getting to the Derby, despite winning two Arkansas Derbys and getting beat a neck in the Santa Anita Derby. He deserves this shot. So now this colt means business and can take his consistency and his strong pedigree, and his closing punch to Churchill with a live shot at the roses. He’s been first, second, or third in eight of his nine stakes, and was a close fourth in his other race, the grade III Iroquois. He’s run big from 5 1/2 furlongs to 1 1/8 miles and has been second, third, and fourth in his three starts at Churchill Downs, so he knows the track well. He is back on the list now that it looks like he, too, doesn’t have to worry about points. Although he’s still dangerous, it’s difficult to get as excited about him as one did before the Santa Anita Derby. Like Cairo Prince, he looked to come up short off a layoff, but he lacked any punch from the quarter pole home and had Hoppertunity pull away from him while under restraint the entire length of the stretch. Should he improve off this effort? He should, but can he improve enough to be a factor in the Derby? He would need quite a form reversal. I do like the fact that he’ll have a work at Churchill Downs and I’m still partial to horses that do, only to get a true feel of the track and how they will handle it in work conditions. Other California horses have shipped in Derby week and won the race without working over the track, but Giacomo did it in a bizarre year when all the favorites peaked the race before the Derby and I’ll Have Another’s gallops were as close to actual works as you can get. So, we’ll just wait and see if he makes a great impression once he gets to Kentucky. He has settled into his new quarters at the Churchill Downs’ Trackside training center and got his first feel of the track, breezing a sharp half in :48 1/5. Although he won the Louisiana Derby by open lengths, he’ll have to improve on that :13 3/5 final eighth. His best running style most likely is laying off the pace, but as he showed at Fair Grounds he can take advantage of whatever is handed to him. He’s had his regression after two monster efforts and is now back on an upward spiral. How far he can take that is anyone’s guess. He’s probably more inclined to excel at 1 1/16 miles to 1 1/8 miles, but he has enough pedigree to carry that farther under the right conditions. Like his stablemate, General a Rod, he won’t be seen much at Churchill Downs, so a drive over to Trackside once or twice is about all you can hope for. The only reason Blue Grass Stakes winner DANCE WITH FATE was not considered for the Top 12 is because his connections have not yet decided whether he is Derby bound, and in fact have shipped him back to California. A decision is at least a week away, so he’ll float around down here until we hear something definite. This is a very solid horse who obviously prefers a synthetic surface, but he did finish second in the grade I FrontRunner Stakes on dirt last year, although that hasn’t proved to be a strong race. His sire, Two Step Salsa, was effective from seven furlongs to 1 1/8 miles, but a mile seemed to be his best distance. This colt has an excellent closing kick, but can he duplicate it on dirt going a mile and a quarter. 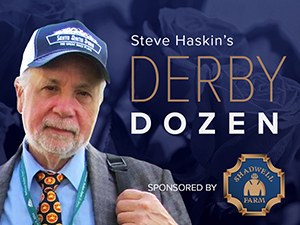 MEDAL COUNT validated Dale Romans’ decision to run back in eight day when he rallied for second in the Blue Grass to earn a spot in the Derby at No. 18, which likely will become 17 after Bob Baffert decides whether to run. It was his big move on the far turn that stood out, but he didn’t have enough to hold off the charging Dance With Fate. He did lose a lot of ground on both turns, so that is something to remember if you’re looking for a betting angle. The son of Dynaformer has run three times on the dirt, breaking his maiden at Ellis Park, finishing up the track in the Breeders’ Cup Juvenile, and running a respectable fifth of 12 in the Fountain of Youth Stakes, beaten 9 1/4 lengths. His form suggests that Polytrack and grass are his preferred surfaces. PABLO DEL MONTE looks to have a bright future after stretching out in the Blue Grass and putting all the stalkers away and then hanging in there gamely to finish third, beaten 3 1/2 lengths. The son of Giant’s Causeway has good dirt form and was competitive against the best 3-year-olds in Florida in January and Febuary. The four horses chasing him in the Blue Grass wound up finishing 10th, 11th, 12th, and 13th, so this was a big effort for him. Bob Baffert likely will decide to run either MIDNIGHT HAWK or CHITU in the Illinois Derby. Both have the points to get in the Kentucky Derby. Chitu worked five furlongs in 1:00 4/5, while Midnight Hawk went six furlongs in 1:13 3/5. West Point Thoroughbreds and Graham Motion will have to make a decision soon on whether to point RING WEEKEND to the Derby after his disappointing well-beaten second in the Calder Derby. West Point no doubt would love to get COMMANDING CURVE, a fast-closing third in the Louisiana Derby, in the Kentucky Derby, but there still a few horses ahead of him who are tied in points but have more non-restricted stakes earnings. Two of them, HARRY’S HOLIDAY and VINCEREMOS, finished 13th and 14th, respectively, in the Blue Grass Stakes, so their status is questionable. UNCLE SIGH, who didn’t have the best of trips in the Wood Memorial, breaking slowly and losing early position, is sitting at No. 21, but likely will make the cut. He should be heading to Kentucky in the near future. TAPITURE, sent off as the 2-1 second choice behind BAYERN in the Arkansas Derby, had no apparent excuse, finishing fourth, beaten over seven lengths, and it’s very possible his distance limitations were exposed. Bayern, with only two career starts and not having run since Feb. 13, came up short and had to settle for third, beaten 5 1/4 lengths. STRONG MANDATE never has looked like his old self this year and it finally caught up with him, as he brought up the rear, beaten over 21 lengths. Still waiting for WILDCAT RED to have his first work since the Florida Derby.